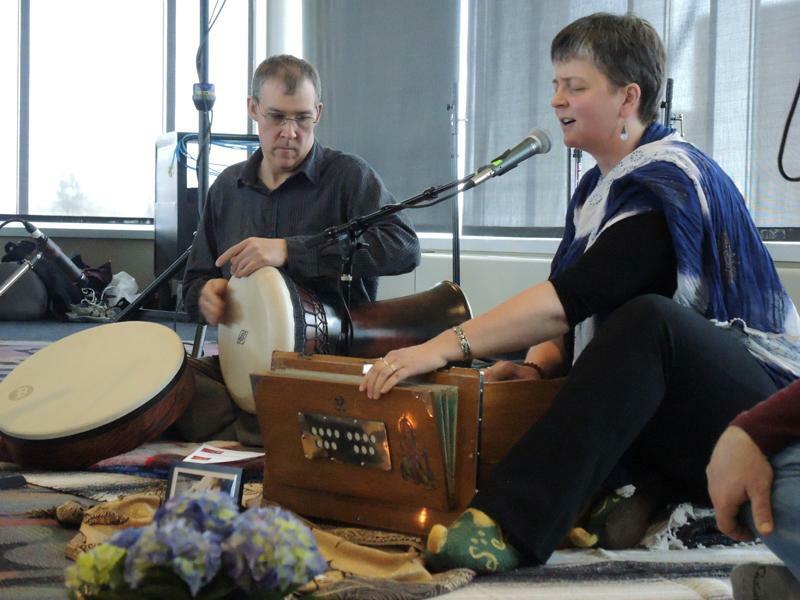 Kirtan Path performs Durga Mantra inviting the audience to join in on the spiritual rhythm. Hamline event features music and chanting from religions like Hinduism, Islam, Christianity and Judaism. “The beautiful voice can’t do much if no one is there to hear it,” were the closing words of Religion Professor Mark Berkson at the Sacred Sound event on Saturday, April 26. Berkson, senior Maria Bacon and junior Nicole Petersen organized the event that filled the Kay Fredericks Ballroom with music for the Divine, resulting in an open interfaith dialogue. The first group to present their music was the band Kirtan Path, representing Hinduism at the event. The band led the room in four different mantras: Ganesh, Durga, Shiva and Krishna. The mantras were all about being closer to the Divine, which was not unique to just the Hindu presentation. This was the theme that united all of the faiths represented that day: Hinduism, Islam, Judaism and Christianity. Every presenter was moved while on stage by their own passionate presentations. Kirtan Path was followed by Zan Aisha Christ, a Hamline alum, and Imam Mohammmed Dukuly, a man renowned for his skill in Quran recitation. Zan Aisha Christ is a convert to Islam who brought Imam Mohammed Dukuly to tears. 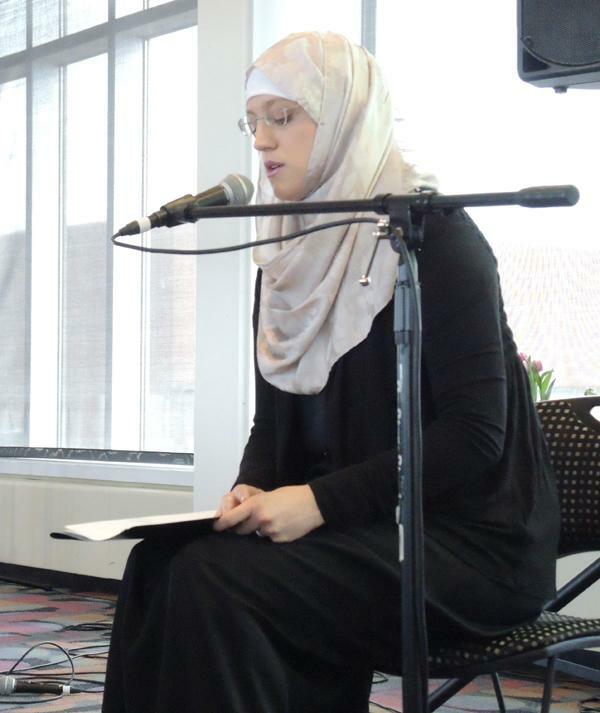 Hamline alum Zan Aisha Christ recites the Quran to a public audience for the first time. “She recited like someone who was born into Islam. It was beautiful. She brought tears to my eyes,” Dukuly said. Dukuly wrapped up the presentation of Islamic recitation by explaining the complexity of Arabic and the importance of language accuracy when reciting the Quran. Judaism was the next Abrahamic faith following the Islam presentation. Maggie Burton and Cantor Neil Schwartz lectured on the different genres, scales and the history of music within Judaism. They delved deep into the relevance the seasons and specific dates play into the music played at synagogue. After this extensive information was relayed to the audience, Burton and Schwartz performed Jewish inspired music with their inspiring operatic voices. 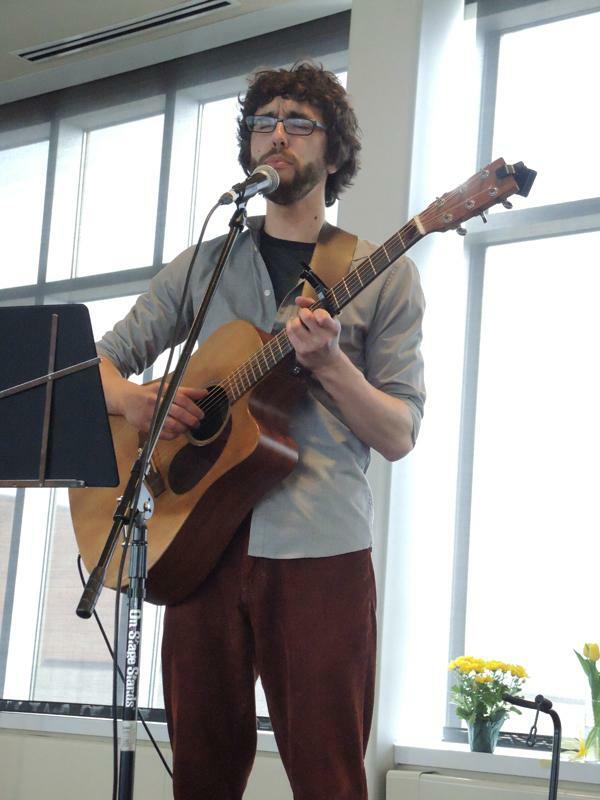 Ross Hackenmiller, another Hamline alum, who represented the musical sounds of Christianity, closed out the evening. He now works to arrange alternative music for the Hamline United Methodist Church. Before performing, he discussed a very abridged history of Christian music, emphasizing the diversity of genres and thought. Hackenmiller performed Taizé music and “Bartender” by The Dave Matthews Band. To conclude the event, Hackenmiller encapsulated the day, performing “I Love You and Buddha Too” by Minnesota native Mason Jennings. Ross Hackenmiller, music director at the Hamline United Methodist Church and Hamline alum, performs Christian Taizé music.